We love eating BBQ and camping at the beach. We’ve come to love black tape too, by which we mean Gorilla Tape. Let’s go down the B list one by one, and you’ll find out why. Or, just watch the video! 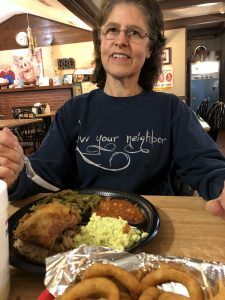 We love BBQ, and one of our favorite BBQ joints is Doug Sauls’ BBQ in Nashville, North Carolina. If your image of BBQ is fall-off-the-bone ribs smothered in sweet, sticky tomato-based sauce, enjoy to the max! But let go of that image when you’re in the Carolinas. We discovered as much when we found Doug Sauls’ BBQ. It doesn’t look like much from the outside, but you can’t judge a restaurant by its looks. Inside we found a small, simple, nicely maintained restaurant filled with the savory scents of slow-cooked pork and fried chicken. The baked (not smoked) pulled pork was smothered with North-Carolina–style vinegar BBQ sauce. Doug Sauls’ son, who took over the business after his father died, explained to us that his sauce is just vinegar, crushed red peppers, and salt. It was amazing, and our taste buds danced with joy at every forkful! Yelp reviews said that their chicken was a must-try, and they were right. Crispy and hot, lightly seasoned and right from the fryer, even the white meat was “wipe your chin after every bite” juicy. The friendly staff noted our northern accents and were eager to share their southern hospitality. Their accents were deep south and even a bit difficult for us to understand at times, but it didn’t matter because their food was mmm-mmm-good! 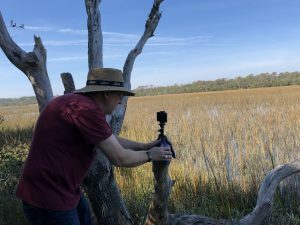 As we continued south, we stopped at what turned out to be one of our favorite campgrounds: Edisto (with the accent on the first syllable) State Park in Edisto Beach, South Carolina. This beautifully maintained park sits on a finger of land between a salt marsh to the west and a gorgeous white-sand beach to the east. In other words, you’re always close to the water. 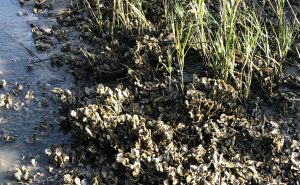 In fact, we were so close that when an especially high full-moon tide came in on our first night, we found that the salt-marsh extended into our campsite and just about to the door of our RV! Thankfully, tides also recede and campsites dry out. The weather turned cold and rainy at Edisto (a developing theme for this trip), but before it did we had a wonderful time riding our bicycles, walking along the beach, and exploring the park’s beautiful and very informative nature center. We’d love to visit again sometime when the weather is warmer. After we left Edisto and continued down I-95 south, Jeff happened to look up at the wooden cabinet above the driver’s seat and noticed that the wood cabinet door was literally falling apart! One good bump and the door could have come crashing down on his head, followed by all the computer equipment stored on the shelves behind it. Not a good thing while driving 60 mph in heavy traffic! Fortunately, we were able to pull safely off the road before such tragedy struck. Upon examination, we discovered that the center panel of the door had come unglued from its wooden frame, such that the whole cabinet door was falling apart. Perhaps you’ve heard that you can fix anything with Duct Tape. Well, black Gorilla Tape is even better! It’s remarkably strong and sticky. After taping the driver-side cabinet door back together, we discovered that the cabinet on the passenger side was starting to break apart, too. 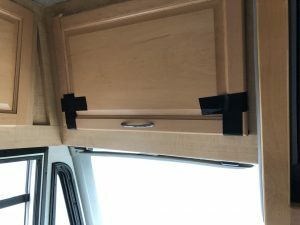 After more Gorilla Tape and a prayer of thanks that we’d discovered the problem before disaster struck, we continued our drive south towards Florida. The first reason is age. Even though our RV had less than 7,000 miles on it when we bought it last year, it was still built in 2004. Over time rubber seals dry out, glue cracks, and unused thingamajigs and whatchamacallits freeze, thaw, rust, come loose, and fail. 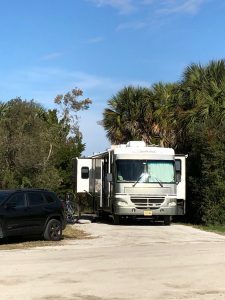 We knew this when we bought the RV, which is why we also bought a comprehensive extended warranty (see which warranty we bought and why HERE) so that we would be able to limit our out-of-pocket cost of repairs. The second reason is movement. Imagine what would happen to your kitchen, bathroom, living room, bedroom and all your electronics if they were subjected to an almost daily earthquake. That’s what RV fixtures experience every time you roll over a pothole, navigate a sharp curve on an exit ramp, or make a sudden (or not so sudden) stop for traffic. 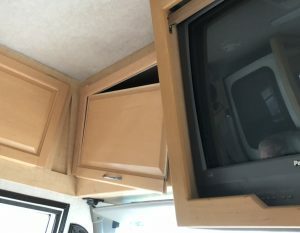 And the outside parts of the RV are simultaneously being subjected to 50, 60, even 70 mph winds. Every time you drive. Again and again. That’s why we travel with a full tool kit and lots of Gorilla Tape! When you think about it, it’s amazing that RVs hold together as well as they do. Next up: “Warm and Sunny” Florida! A VERY IMPORTANT REQUEST: If you enjoy our videos, please take the time to give them a “thumbs up,” and also to subscribe to our YouTube channel. You see, YouTube has millions of videos, and the more views and “thumbs ups” our video has, the more likely it will be recommended to others. And the more subscribers we have, the closer we get to having a unique YouTube address for our channel and being able to get a small slice of the revenue YouTube generates from their ads. So, even if you’re subscribed to this blog, please go ahead and subscribe to our YouTube channel too. (You can subscribe by following this link to our channel’s home page, or by clicking “Subscribe” when watching any of our videos.) Thanks! This entry was posted in Destinations, Our Journey, Problems, Stuff We Like, Uncategorized, YouTube Video and tagged Barbecue, Barbeque, BBQ, bicycle, bicycling, Camping, Doug Sauls, edisto, Edisto Beach, Fleetwood, gorilla tape, journey, motorhome, North Carolina, our story, RV, South Carolina, Southwind, YouTube. Bookmark the permalink. 1 Response to BBQ, Beaches, and Black Tape!